The PROTEOSTAT® Thermal shift stability assay kit includes a fluorescent dye which detects protein aggregation, so it can be used to monitor protein stability under systematic thermal stress conditions. 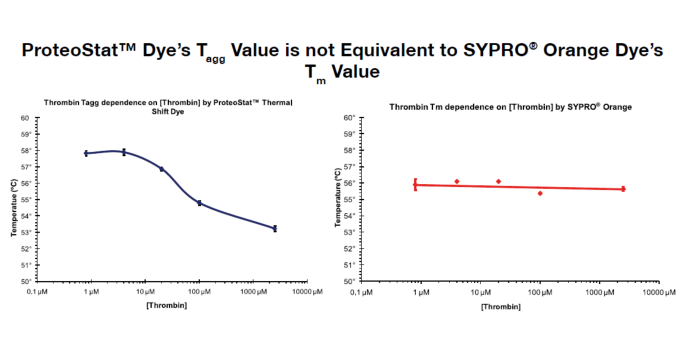 From the thermal shift assay, a temperature at which the bulk of the protein becomes aggregated can readily be identified. The aggregation temperature is an indicator of protein stability and can be used to optimize conditions that minimize protein aggregation as well as to identify ligands that bind and confer structural stability to a protein of interest. Use the related PROTEOSTAT® Protein Refolding and Aggregation Sensing Kit (Prod. No. ENZ-51040) to identify optimal protein refolding conditions. Conditions that increase the aggregation temperature, increase the stability of the protein. Figure 1. Typical results of the PROTEOSTAT® Thermal Shift Stability Assay are shown for goat anti-mouse IgG (11.2 mg/ml at pH 7.4). Using a RT-PCR instrument programmed to ramp the temperature from 30° to 99°C at a 3°/ minute rate, while reading the fluorescence continuously. The blue line represents the raw fluorescence data, and the red line shows the corresponding first derivative trace, highlighting the slope of the fluorescence intensity curve. The first derivative plot provides the aggregation temperature of the protein (Tagg: The point of maximal slope). Figure 2. PROTEOSTAT® Dye’s Aggregation Temperature is not equivalent to the Melting Temperature Obtained Using SYPRO® Orange. SYPRO Orange dye is an environment-sensitive dye that binds to the hydrophobic regions of unfolded proteins. It can be used to measure Tm. Tm is the temperature mid-point of a thermal unfolding curve. At the temperature midpoint Tm, one half of the target proteins in a sample are unfolded, and one half of the target proteins in the sample remain folded. Unfolding does not depend upon neighboring proteins. ProteoStat is a molecular rotor dye that binds to the surface of protein aggregates. Tagg refers to the mid-point of a thermal aggregation curve. Proteins unfold and then subsequently aggregate. Aggregation depends upon neighboring proteins. The higher the protein concentration, the greater the tendency to aggregate. Application Notes: This kit has been designed for monitoring protein stability under systematic thermal stress conditions. Quality Control: A sample kit from each lot of PROTEOSTAT® Thermal shift stability assay kit is tested using the procedure described in the manual. 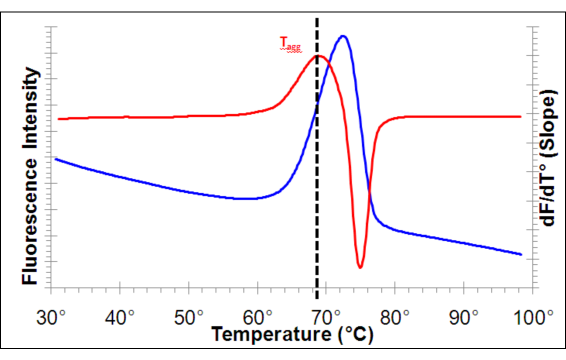 The detected aggregation temperature for 16µg/ml of β-lactoglobulin is a single peak at 76° ± 2°C. Use/Stability: With proper storage, the kit components are stable up to the date noted on the product label. Store kit at -20˚C in a non-frost free freezer, or –80˚C for longer term storage. Enzo and PROTEOSTAT are trademarks of Enzo Life Sciences, Inc. Grenier is a registered trademark of Grenier Bio-One. Several of Enzo’s products and product applications are covered by US and foreign patents and patents pending. This product is manufactured and sold by ENZO LIFE SCIENCES, INC. for research use only by the end-user in the research market and is not intended for diagnostic or therapeutic use. Purchase does not include any right or license to use, develop or otherwise exploit this product commercially. Any commercial use, development or exploitation of this product or development using this product without the express prior written authorization of ENZO LIFE SCIENCES, INC. is strictly prohibited.